Online ordering menu for TaOne Asian Fusion. We pride ourselves in providing an authentic Asian Fusion experience. Over 120 menu items are available, from stir-fry, noodles, curries, soups, salads, appetizers, sushi, and specialties. 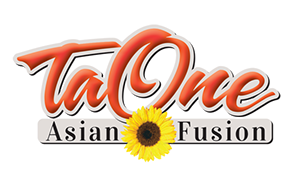 Come try our Thai, Japanese, Seafood, and Sushi dishes with TaOne flair. Located at the corner of South State Road 7, near the Wycliffe Golf & Country Club. Order online for carryout today!